Justin and The Tennessee Kids brought The 20/20 Experience to Nashville, Tennessee at the Bridgestone arena on December 19, 2014. It was a home state concert and one to remember! The team was on point, the crowd danced nonstop, and the legendary Garth Brooks made an appearance to sing "Friends In Low Places!" Check out the photos and videos below! To see more photos, view the full gallery HERE. 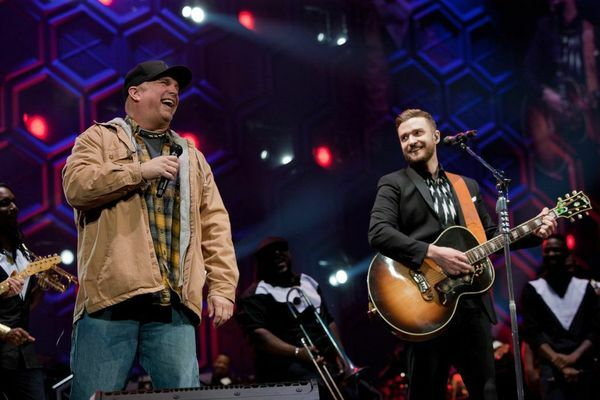 There are two more chances to see Justin and The TN Kids on #JT2020Tour. Get tickets HERE for the January 1st and 2nd shows at the MGM Hotel & Casino in Las Vegas. This show was INCREDIBLE!!!! I was blessed to have been able to see the 2020 tour for a second time and to top it all off Garth Brooks!!! I miss the tour so much already and I can't wait to see what the future holds for JT and all of the TN Kid family. this show was amazing i see vidoes on this show and im sad beacuse i want to go to the show. but i think to all the pepole who come to your show you give them amazing experience i love you so much and im so glad youre part of my life!!!!! i love you justin!!!!!!!!! !